"I am an unwavering defender of the Constitutional right of every individual American to own firearms for the defense of our families and, ultimately, our freedom," Glenn said. "That will include voting as a U.S. senator against the United Nations Small Arms Treaty and against any other attempt to infringe on our 2nd Amendment right to keep and bear arms." 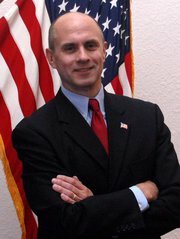 Hoekstra in debates has defended his vote for the Brady Bill by claiming that its only effect was to prevent criminals from receiving handguns. See U.S. Senate debate at University of Michigan-Dearborn: http://en.sevenload.com/videos/9oIqNmk-Senatorial-Debate-Part-2 with Glenn beginning at 21:00 and Hoekstra at 22:50. "It did no such thing," Glenn said. "Criminals simply ignored the law as they do all gun control laws and continued to get guns as they always do, illegally. The only thing the Brady Bill did was violate the 2nd Amendment rights of law-abiding citizens by forcing them to wait five days for a federal background check before being allowed to purchase a firearm to defend themselves and their families." Glenn during campaign appearances has routinely worn a cap which reads, "God, Guns, and Guts made America. Let's keep all three." In 1987, the Center for the Study of Market Alternatives, a free market think tank located in Idaho, named Glenn and former National Rifle Association President Charlton Heston co-recipients of its "Freedom Fighter of the Year" award. Glenn, a former county commissioner, in past campaigns has been endorsed by the National Rifle Association, Gun Owners of America, and Citizens Committee for the Right to Keep and Bear Arms. He served eight years in the U.S. Army National Guard, during which on several occasions he qualified as an "expert" marksman with perfect "40 out of 40" scores on annual M-16 rifle qualification tests. In the 2012 U.S. Senate race, Glenn has also been endorsed by former Gov. Mike Huckabee, National Right to Work PAC, Term Limits America PAC, and Right to Life of Michigan. This guy needs to run for President! With his qualifications, he certainly deserves to be there more than our current President!